For mountain ranges of the Himalayans cross Ladakh, the Greater Himalayas, Zanskar, Ladakh and the Karakoram and so does the mighty Indus river. It is a magical and remote moonscape and its mountains spectacular, the people delightful, gentle and ungrasping it's religion ancient and its monasteries waltered over the period of time. This land of wilderness and overwhelming natural beauty beckons the more intense and adventurous traveller. Morning flight to Leh. Transfer to hotel day at leisure to acclimatize to the high altitude. Overnight Leh. Full day sight-seeing tour of the monasteries - Hemis, Shey and Thikse. The Hemis gompa is the highest monastery in Ladakh and contains gold status. Stupas decorated with precious stones and any priceless old Thankas. Shey gompa is situated in the ruins of the old palace of the kings of Ladakh. Thikse gompa is built on the model of the Potala palace in Lhasa in several levels of construction. It contains the three storeyed statue of the Maithriya Buddha, the future Buddha. Overnight Leh. 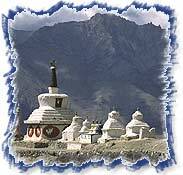 Morning sight-seeing of Leh palace, Shantistupa and Shanker Gompa. Afternoon drive to Stok across the river indus to see the Stok palace. Evening free to explore the bazaar overnight Leh. Drive to Uleytokpo (2hrs), enroute visit Likir and Phyang monastense. Uleytokpo is famous for its apricot orchards. Camp/hotel is set on the banks of the river indus in the apricot orchards. Day return excursions via local villages to Alchi monastery - one of the oldest. Overnight in hotel.